Project Kuiper could bring greater connectivity to the world. As broadband internet becomes more widespread and grows in popularity, so do the big players increasingly join the race as they look for their piece of the pie. Now Amazon has confirmed to GeekWire that it is actively working on a project whose goal is to put thousands of new satellites in Earth’s low-orbit, which would be used to bring broadband internet to users around the world. 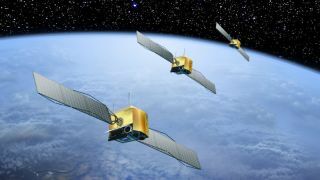 “Project Kuiper is a new initiative to launch a constellation of low Earth orbit satellites that will provide low-latency, high-speed broadband connectivity to unserved and underserved communities around the world,” an Amazon spokesperson said in an emailed statement. A total of 3,236 satellites would be placed in low Earth orbit, it was said, with varying heights. Even though the project would most likely cost billions of dollars, GeekWire believes it could bring in even more billions of dollars for the company. However, it will have to fight its way through the likes of SpaceX or OneWeb. The project is called Kuiper, and its first step was made last month, when it made three sets of filings with the International Telecommunications Union.